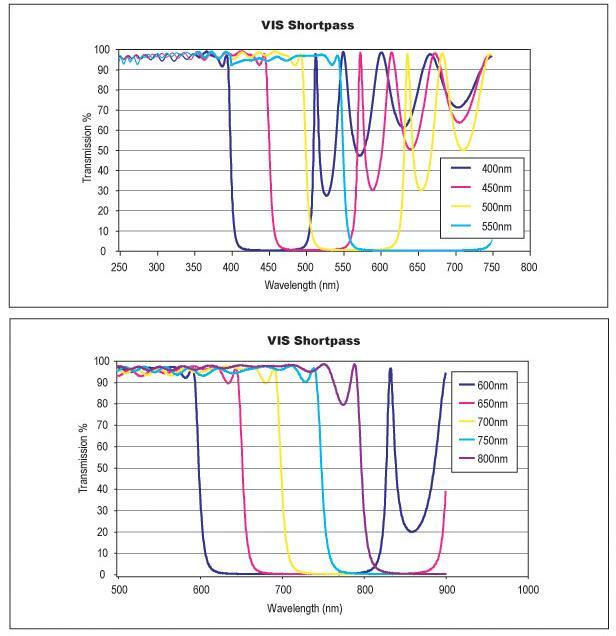 Shortpass filters are designed to have a very sharp transition from transmission to reflection, making them extremely useful in a number of applications. Available in a variety of cut-off wavelengths, they are ideal for fluorescence applications, Display, separating spectral orders, and creating custom, efficient bandpass filters when combined with longpass filters. With an average transmission of 85% and a blocking optical density of 2.0, excellent contrast can be achieved in machine vision and gauging applications. A single layer AR coating on the back surface enhances the overall efficiency of each filter.